A repeat of Monday morning’s weather as the fog blocked the view on Tuesday morning, before giving way to another perfect blue sky day and racing underway just after 1400 hours. Another unpredictable onslaught of conditions out on the two course areas today saw some favourites unseated from their usual dominance at the front of the fleet. The up and down breeze took a while to stabilize, and continued to be variable throughout racing, from virtually nothing up to around 8-10 knots. The 470 Men Medals have all been claimed, with gold to Israel and the fight for silver and bronze between Hungary and Israel, whilst in the 470 Women Germany is assured of gold and silver with 6 other teams in the hunt for silver and bronze. 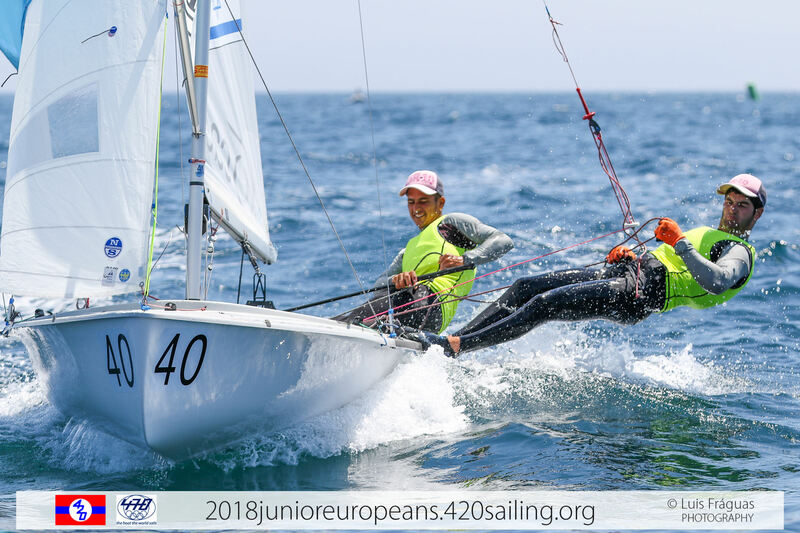 With two more races to go in the 420 Open and 420 U17 fleets, the frontrunners are looking safe based on form so far, but anything can still unfold. Wednesday’s final day features two races for each of the 420 Open and U17 fleets, with a scheduled start at 1300 hours. The top ten in the 470 Men and Women advance to the medal race, with the men racing at 1400 hours, and women at 1445 hours. Before that, the rest of the respective fleets will contest a final race, starting at 1300 hours for the men, followed by the women. Bit of a struggle on the 420 course, which experienced a totally different weather system compared to the 470 fleet race track. Postponements on the water only emphasized nerves and expectation as teams patiently waited for racing to get underway in the light breeze. Not a good outing for overnight leaders Enzo Balanger/Gaultier Tallieu Gueydan (FRA), who shocked their scorecard by placing 24, 16 making it their worst tally of the series. As a consequence, they traded places with Spain’s Martín Wizner/Pedro Ameneiro who finished 5,1, and count an impressive series of all top 5 finishes, including four wins. Third to Pablo Ruiz Miguel Martínez-Fortún (ESP). “We are feeling good, very good,” smiled Wizner after racing. 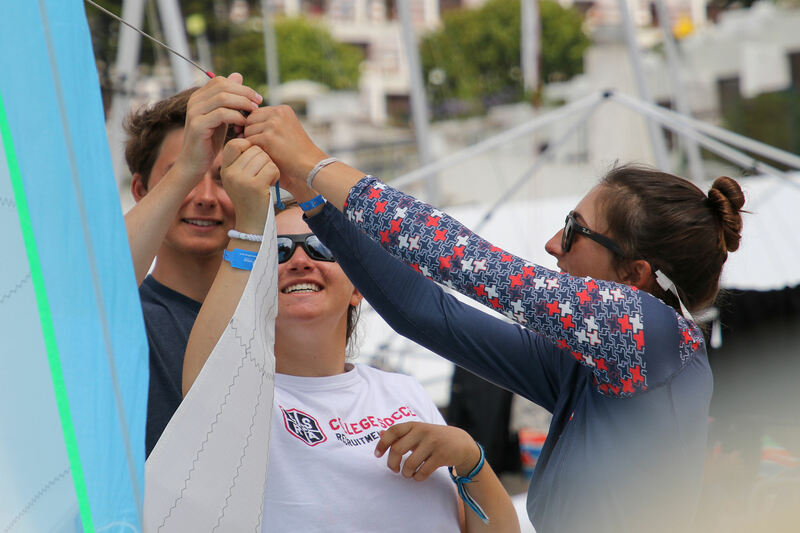 “The objective we had in this regatta was to not have any bad results. We are always in the top ten, so we have got to the last day without any bad races and we are very happy with that. We will see tomorrow how it goes." Two races to go on Wednesday to decide the podium and whilst the leaderboard is in theory still wide open, in practice we can predict a battle for gold between the top two teams. 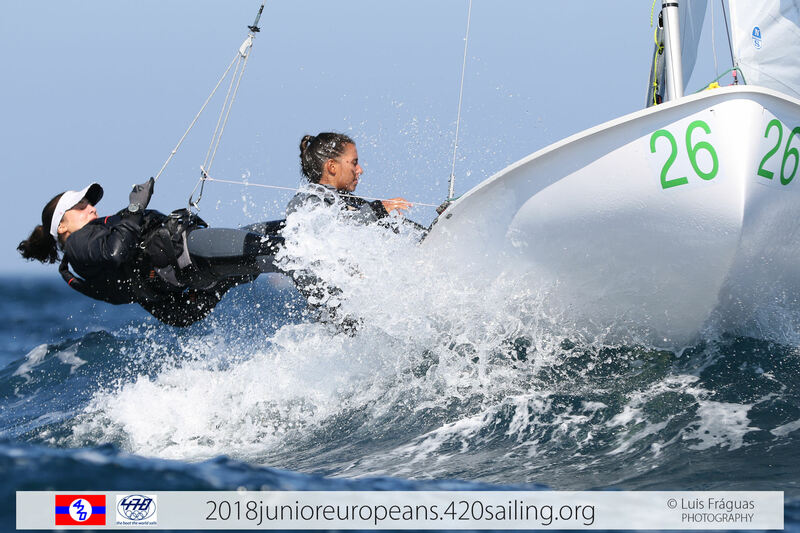 A significant nine place leap up the leaderboard from Clara Olive/Solenza Mariani (FRA) consolidates not only their position in the 420 Open fleet, but most likely seals their grasp on the 420 Women’s title too. The pair trumped the 49 boat gold fleet with a win in race 9, and backed up with a 4th in race 10. 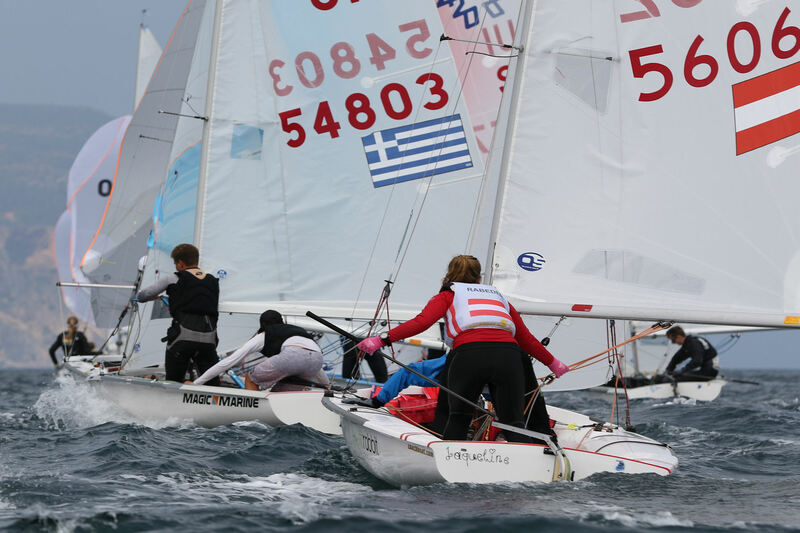 Greece’s Ariadni-Paraskevi Spanaki/Myrto Papadopoulou are the second placed women’s team in 18th overall, with Carlotta Scodnik/Camilla Scodnik in 23rd. Australia holds onto the top two places in U17, with Cole Tapper/Tyler Creevy and Ryan Littlechild/Jack Ferguson out front. Poland’s Jakub Gołębiowski/Filip Szmit have bounced back from yesterday’s equipment failure and move into third overall from scores of 1,7, ousting the USA’s Oliver Hurwitz/Ethan Froelich to 4th. Tapper/Creevy scored their first win of the Championship in race 10, but this team is not about the race wins, but a steady approach to come out on top. There is a 60 point spread between the top ten teams, and with 44 boats racing in the U17 fleet there is still plenty of opportunity to unseat teams and seize a leader board breakthrough. 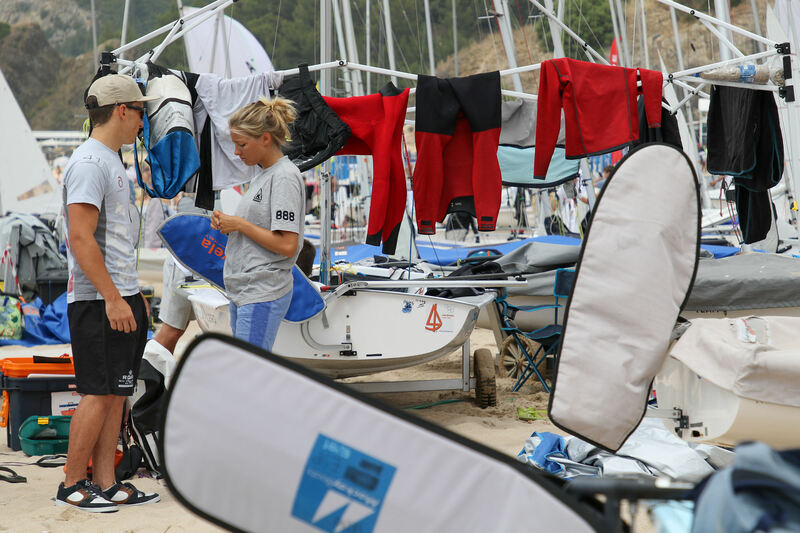 In the women’s line-up, Greece’s Melina Pappa/Maria Tsamopoulou hold firm as top placed women in 7th overall, with Poland’s Zofia Korsak/Karolina Cendrowska in 15th, and Spain’s Marina Garau Bosch/Blanca Cabot Sancho in 22nd. Down to the wire in the 470 Men and 470 Women as the pressure escalated further to make the top 10 medal race cut. Israel’s Maor Abu/Yoav Rooz have struggled the past few races in the unpredictable breeze and pressure pockets dotted around the course. They launched today’s final assault on the medal race with another disappointing 11th place, after choosing the wrong side of the course in the first upwind. They emerged victorious though, as a win in the next race though put them in an unassailable position for Wednesday’s medal race. A best ever result for the pair, although they still have to start and finish the medal race cleanly to guarantee the gold around their necks. 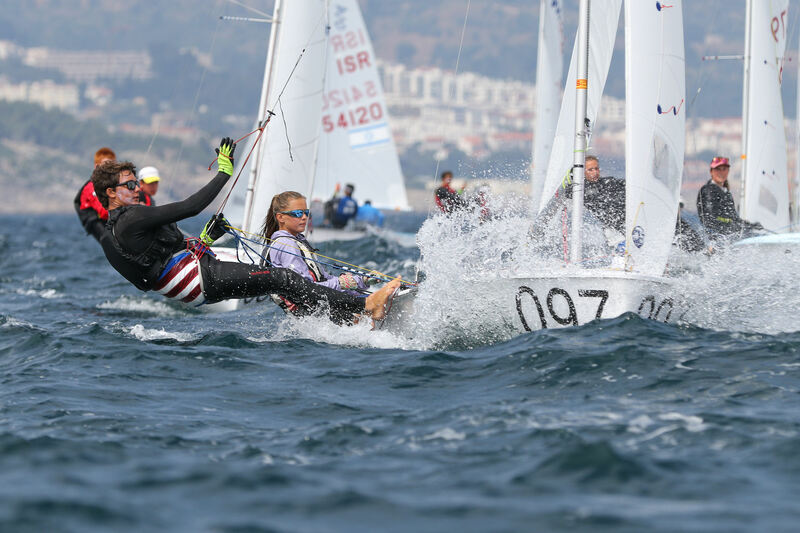 They have both come to the 470 Class via the 420 and the Optimist, and interestingly Abu secured Israel’s best ever result in the Optimist Class, a 2nd at the 2012 Optimist Europeans. Hungary’s Balázs Gyapjas/Zsombor Gyapjas managed to overhaul Nitai Hasson/Tal Harari (ISR) by 3 points, and the battle for silver and bronze will unravel between these two, as none of the other teams are in contention as the points differential is too great. Best ever Championship outcome with a silver or bronze for the Hungarian brothers, as a jubilant Zsombor said, “We are very happy of course. We have had a hard Championship. In the beginning the wind was not what we prefer, but at the end came the lighter breeze so we managed to be in 2nd before the medal race. “We haven’t spoken about our plan for the medal race yet,” said Hasson when asked about his strategy to hunt down the Hungarians and upgrade bronze for silver in the medal race. 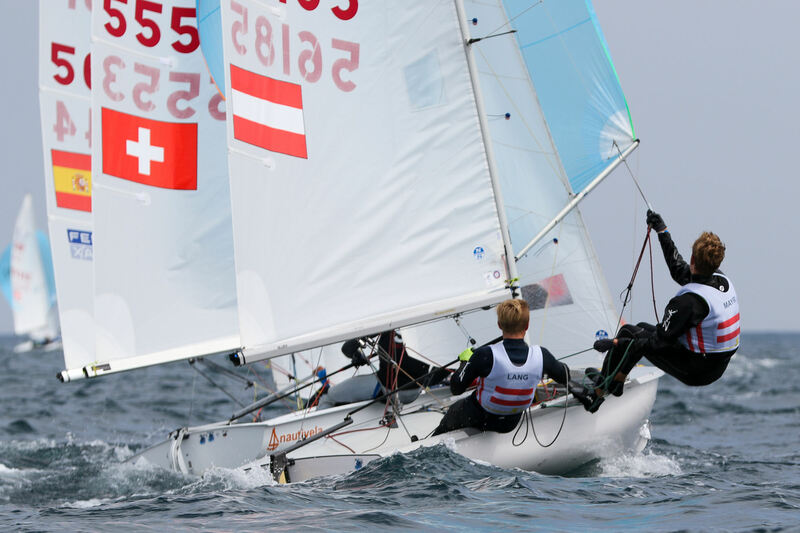 After the first race 10 of the day, Theres Dahnke/Birte Winkel (GER) had amassed a 21 point advantage. Hold onto that and they had the gold medal sewn up, but they lost their pace in race 11, finishing 7th and instead advance to the medal race battle assured of gold or silver – not a bad day in the office! The pair’s previous best result was 6th place at the 2016 420 Junior Worlds, so they can now celebrate a career best in their pockets. Luise Wanser/Helena Wanser (GER) go into the medal race in second and Marina Lefort/Lara Granier (FRA) in third. Behind these two, in theory any of the teams down to the Polish in 7th have a podium punt. The Polish team, Antonina Marciniak/Hanna Dzik, are facing their first ever medal race together and have an outside chance at bronze if they win the medal race and the teams ahead of them finish at the back of the fleet. 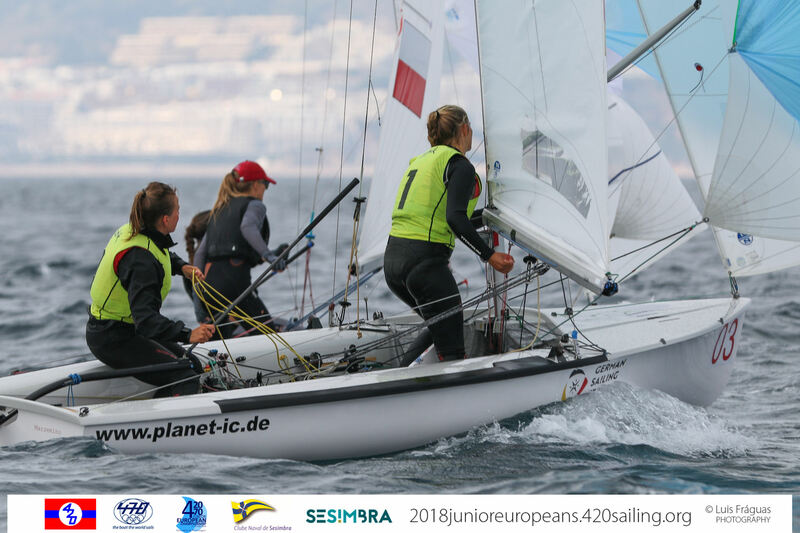 Two new faces found their feet to control the fleet, with Francesca Russo Cirillo/Alice Linussi (ITA) winning the first race, and Charlotte Yven/Julia Colombe (FRA) the second. But their strike was a bit too late, as both missed the medal race cut.